The Partners ganged up on me this morning, lobbying for a trip to someplace good in the car. They just LOVE going places in the car. It’s a cold, crisp morning with occasional flurries around here, and some slippery spots on the roads. I loaded up the dogs and headed for the leash-free area on Etobicoke Creek. They love that spot, in part because there are usually some larger dogs around, making for good play opportunities. This morning there were not so many dogs around as there are in the nice weather, but The Partners did get a chance to play with a pair of Great Danes and a couple smaller dogs. 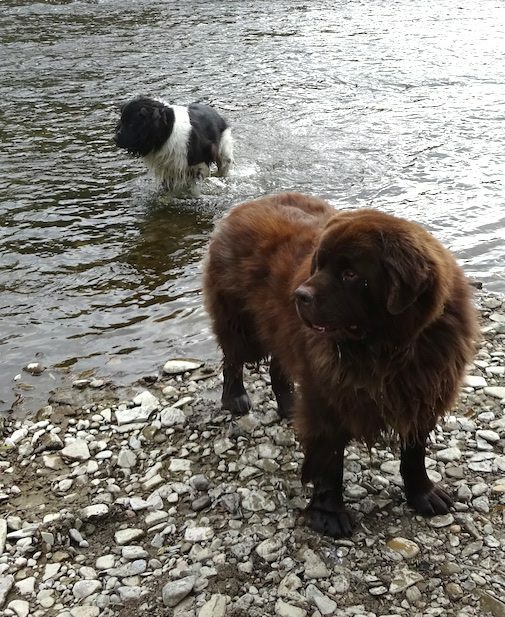 George and Ruby both looked at the creek and decided it was just too cold for a swim. In my world that makes it winter. Recently, The Partners decided they like to carry around sticks. This is a new development. The don’t want to chase sticks or retrieve them, particularly. They just enjoy carrying them around. The Etobicoke Creek leash-free is an excellent spot. There are both open and forested areas and plenty of access to the creek. The far side of the creek is steep so it forms a natural barrier. The park is bordered on the opposite side by retail (like Starskys) and light industrial uses, with a good safe fence bordered by bushes and shrubs. The leash-free zone runs along the creek. There is plenty of space and plenty of variety, and swimming opportunities make it a premium spot in season. Access to this area is at the end of Southcreek Rd, south of Dundas, just west of The West Mall. Although there is a bridge on Dundas over the creek, the existence of a leash-free area is not obvious and I wouldn’t be surprised if many people were not aware you could get down in there and let your dogs run and play freely. There is parking for a few cars at the entrance to the leash-free area, with additional parking a few feet away. The leash-free area has a double gate and a few garbage receptacles for poop-bags.